Manager Shaun Derry says saving Notts County from relegation would rank as his best moment in football. As a player, Derry won promotion to the Premier League with Crystal Palace and Queens Park Rangers. He took over as Notts boss with the club bottom of League One in November, but after beating Swindon on Saturday, they need just a point at Oldham in their final game to avoid the drop. "It would be the greatest achievement," Derry told BBC Sport. "I understand what the game is about - I know that managers do come and go and the longevity of the job, sadly, is not there for the wrong reasons. "But I know the start to a managerial career is so important. I want to start on a high and not on a low. To get relegated would be an almighty low for me. "I want to stay in the game, be here long time and get this place to where I feel it can go." 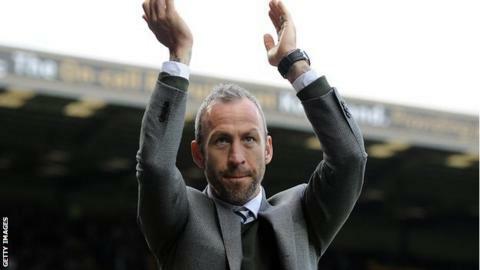 Shaun Derry Notts County boss on the stress of the job. The former Sheffield United, Leeds, Crystal Palace and QPR midfielder made more than 650 career appearances, most at Championship level and above, before making the surprise move into management at the club where he started his career as a trainee. Derry insisted he always had faith in the club retaining their their-third tier status, but admitted ending a spell at Millwall, where he was on loan from QPR, to take the job at Meadow Lane was a stressful retirement plan. "It has been a tough transition, but it has been a transition that I felt I've been ready for a couple of year now," he said. "I thoroughly enjoyed my time at QPR and knew when I got to Millwall - with greatest respect to Millwall which is a great football club - that I wanted to go down a different avenue. "It has been difficult a lot of the time, but decisions that have to be made, I'm comfortable with. "It's strange because you enjoy the job after it is done - I don't enjoy being out there and going through those emotions. Ask any manager, and they would be lying if they said they enjoy it."